Both of those could be a little bit better. A bit more palmar flexion, and controlling that overtaking/rolling rate better on the follow-through. Best advice I can give you right now: review your photos and the notes beneath them, and spend a little time working on those things again. Start small, and slow, and short… and you'll find that you can get back to higher speeds relatively quickly. Not as slow as the last time, the first time, but not immediately full swings, either, at full speed. I was able to get some range work in today. I did many drills and dribbled many balls 20 yards while swinging 2 MPH. I went through my notes and worked on a few things. 1. Keeping a steady head in the backswing, focused on pushing my left shoulder down to finish my turn. 2. (Main priority) I worked on supinating the heck out of it. Bowing wrist from the top, throughout downswing, and through the finish. I really wanted my lead arm way ahead of the ball at impact (feeling). 3. (Minor priority) I wanted to maintain lead arm depth in transition. I feel as if I did NOT do this enough, but I was focusing too hard on the main priority. Good example of what I was trying to do. Not in love with backswing, would like more supination and depth in downswing. Overall I think this was successful. Regained feelings and coordination. I think my backswing needs to improve by having almost no cup or slight bow at the top. I may not be physically able to bow the wrist enough if it’s cupped. Looks like you got mostly back on track. You're right about the arm depth, but it wasn't "bad" in the last two videos. Not great, but better. Ok, thanks for the info so I know where I stand. So I’ll keep working to get deep and as supinated as I can. I was going to make an appointment with you sometime in the next 7-17 days. I don’t know what to do next. Am I close to being able to play? I'm not sure what supination you keep talking about. Do you mean palmar flexion of the left wrist? Also, you should be fine to play any time… but also, even Tour pros are working on things. It just depends, in part, on how far you get and how far you want to go. Yes. Sorry, I thought supination was bowing your lead wrist. I didn’t think about it. Just got into a loop. You give task, I complete. Then repeat. I felt close to being ready for the next one. Sure, any time. But you just took a long time off and haven't been practicing much, or I'm misunderstanding? As you know I'm not a big fan of piling more in when you're already thinking/working on two things. This is hardly worth posting, but for the sake of tracking progress here it goes. Sorry for the long post, it’s long because of some confusion. I will keep them shorter in the future. Starting the session my plan was to get the backswing and transition deeper, increase bowing my lead wrist throughout the downswing, increase forward shaft lean at impact. I stood farther from the ball like in original lesson to accomplish this. This was upsetting. I was most concerned with the wrist flip. Standing farther away took away my ability to pivot around with my body. I felt like I was reaching for it. “Very arms” feeling to reach ball. So it flipped, which stinks. So I spent the entire remainder of the session doing in-to-out drills. I almost didn’t include this, but it might be my best total vid of the day-so it gets included. I imagined the foam noodles from my first drill; under the first, over the second. Regained a backswing feeling. I felt like I really pushed the club low and shifted to my back foot. I think my backswing improved during this session. THOUGHTS-I think I was spinning out with hips. Will try to drive hips in order to allow club to drop in transition. Also body keeps moving in backswing. Must try to keep posture. This session was very strange, I think I improved my backswing but REALLY struggled with contact. 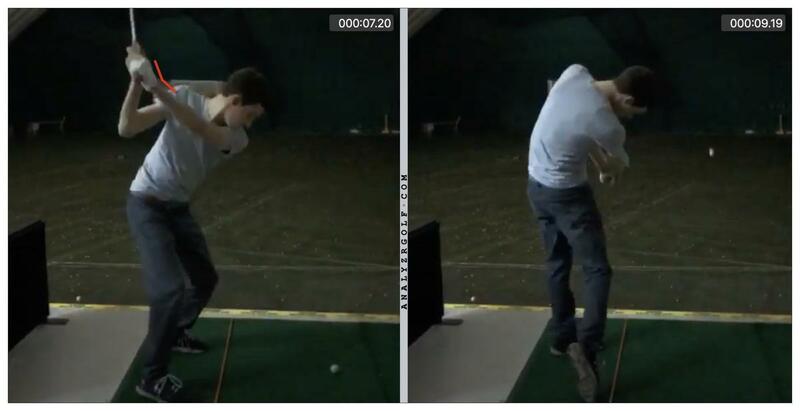 (Inside out feeling was gone) I thought last session was very successful with how my body was working on the downswing. And I thought-based on the follow through-that I was truly swinging properly for the first time. 1.Start with the under/over drill to get backswing pressures working properly. 4. Driving hips may allow my “downswing pivot” -inside out feeling- try to get that feeling. Your "flip" is more because your hands slow down. Keep your hands going faster, keep your pivot speed up. If your right hand "throws" the clubhead at the ball, that'll slow down your hands, too. You're still on track with things. Make shorter swings where the ball pushes or draws, and work your way up to longer swings. Going at full speed just "trying" to do things isn't a great way to practice. Work at the edge of your ability. Ok thanks for the advice, I will do that with my hands. Darn I tried to do toe line. There’s a stupid railing I have so strap my tripod on to. But I’ll take more care with it. Ill do more slow swings rather than ~20% slow swings. Spent about 3 hours of mirror/ slow motion work last night-trying to improve backswing plus the usual. Today I went to the range after work. 4. bow wrist throughout the downswing. BACKSWING: I was trying to take it back low and wide. I did not like, will scrap it. Will go back to trying a more centered pivot. I think I’m getting behind it and can’t pivot around into contact this way. So I must use arms more. TRANSITION: The goal was to drive hips in transition to allow arms to fall down. I was not able to accomplish this today because my body was way too far behind it. Could not hit ball. 1. Work on a more centered (feeling) backswing to allow for better contact. 3. Drive hips more toward target in transition. Lastly- I changed my posture a bit to stand closer to ball. Let me know any thoughts on it. Also don’t like the “classic set up” post because that’s what I was trying to do in the first place lol. I think things are fine. I don't know what the "improved backswing" is, but I don't think I'd worry about it. Your head is moving around a fair bit - down to start, up late in the backswing, etc. and that's probably why you can't "find the ball" very well. Ok thanks, I’ll work on steadying my head. Ive been trying to stop all that dipping around. I will try to accomplish that by keeping my head still. Just minimized. Make a few backswings with your forehead on a towel that is on a wall. I went back to standing farther from ball to get more depth. Backswing feel... deep. Get it deep, keep it deep. Made sure hands did not move away from body to start swing. This last video #3 was after I did a lot of work on keeping my head still. 1. When I kept my head still, I I felt like I wasn’t turning very much and was just moving my arms back. 2. I don’t know what to do going forward, are these good? I don’t know what posture/backswing to use. 3. I do not know about this impact. I’m used to having a more vertical shaft at impact (maybe because I had bad fundamentals?). But I felt as if my misses would be duckhooks if this is my future swing...but that’s for my next lesson I assume. Lastly, I did not have enough mental energy to practice too hard today. I used too much at work. I will be more aware of this in the future and maybe skip the day. For instance I could not cut off my swing. Let me know if you're going to be up in Erie next. There's more good there than you're giving yourself credit for, but the breaks you seem to take might have hurt a bit. I feel like you kind of "lost your place" a little bit. Yes, I def lost my place. but the breaks you seem to take might have hurt a bit.